This is a rectangular Fishing Lures Paw Paw Bait Company porcelain sign. 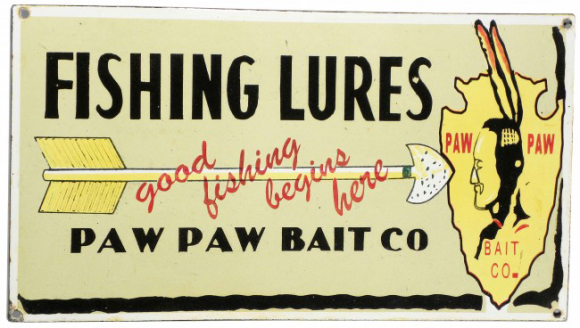 This particular Fishing Lures Paw Paw Bait Company sign is tan with red and black text. It reads, “Fishing Lures, Good Fishing Begins Here, Paw Paw Bait Co” and features a yellow arrow and arrowhead.